In October I participated in a number of media interviews that focused on the need for members of the community to be 'health prepared' for disasters. These interviews were undertaken within the context of bushfires. At the time of the interviews, a number of large bushfires were devastating regions of New South Wales. 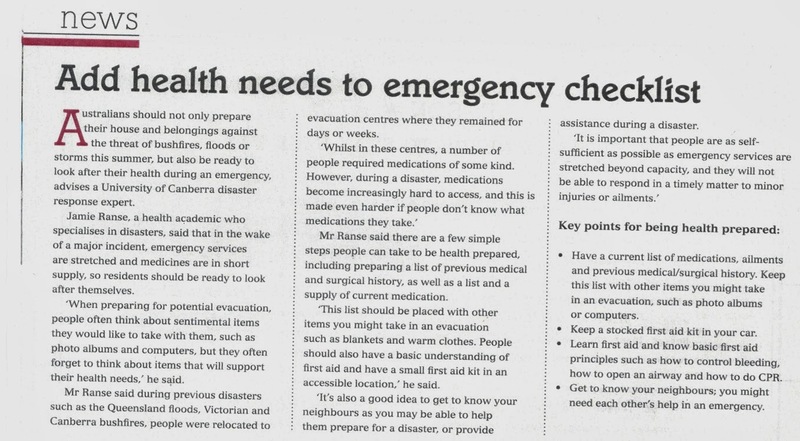 Australians should not only prepare their house and belongings against the threat of bushfires, floods or storms this summer, but also be ready to look after their health during an emergency, advises a University of Canberra disaster response expert. 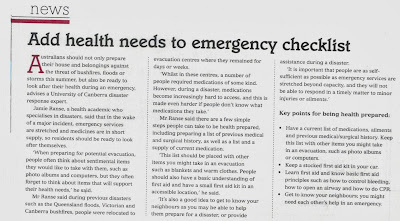 Jamie Ranse, a health academic who specialises in disasters, said that in the wake of a major incident emergency services are stretched and medicines are in short supply, so residents should be ready to look after themselves. “When preparing for potential evacuation, people often think about sentimental items they would like to take with them, such as photo albums and computers, but they often forget to think about items that will support their health needs,” he said. Mr Ranse said during previous disasters such as the Queensland floods, Victorian and Canberra bushfires, people were relocated to evacuation centres where they remained for days or weeks. Mr Ranse said there are a few simple steps people can take to be health prepared, including preparing a list of previous medical and surgical history, as well as a list and a supply of current medication. “This list should be placed with other items you might take in an evacuation such as blankets and warm clothes. People should also have a basic understanding of first aid and have a small first aid kit in an accessible location. “It’s also a good idea to get to know your neighbours as you may be able to help them prepare for a disaster, or provide assistance during a disaster. Have a current list of medications, ailments and previous medical/surgical history.